When our plans to spend time with friends in London changed at the last minute, Tony booked us a Cotswold Way walk to fill in our travel gap. 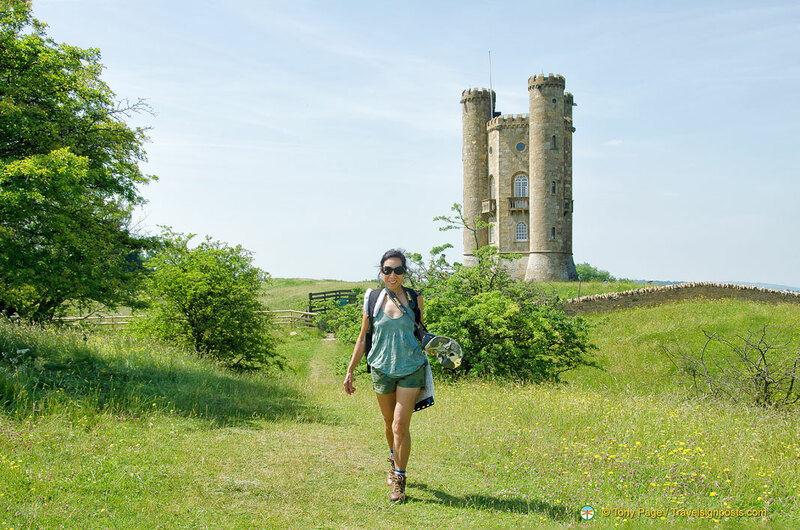 The full Cotswold Way Walk is a 164 km long national trail that runs between the market town of Chipping Campden in the north and the city of Bath in the south, and I was very relieved that Tony didn’t commit us to the walking the whole trail. Instead he chose one of the many variations you can do of the Cotswold Way Walk. Ours was a 6-day circular walk starting and ending in Moreton-in-Marsh. Our walk was organized by Andrew Guppy of Cotswold Walks. He and his wife Elizabeth have been organizing Cotswold walks since 1993. They offer a range of self-guided and guided walking itineraries and Tony chose to use their services as Andrew was very good to deal with. When I saw that our itinerary for the first few days involved walks of over 20 kms per day, I was a little panic-stricken, as I had not done any training. Whereas Tony regularly jogs and is fit as a fiddle, I on the other hand have only been doing walks of no more than 6 km at a time. But Tony reassured me and said that if at any time we felt exhausted, we could catch a local bus to our next destination, which was easier said than done. Local Knowledge – As a last-minute holiday add-on, we didn’t really have time to research the Cotswold Walk and so we relied entirely on Andrew Guppy’s notes and maps to steer us from village to village. Ignorance is not bliss when it comes to walking the Cotswold. Contrary to what I had imagined about a clearly marked path from A to B to C, our Cotswold walk took us across farmland, wooded areas, open fields and along tracks less travelled. Andrew’s instructions for each day were very detailed and precise. Without his local knowledge and guide it would have been impossible to find the many kissing gates, stiles, field gates and hedges that we needed to go through to reach our destination each day. It did occur to us that we could have got quite lost without his notes, but by following his step by step instructions, we arrived safely at our destination every day. Interesting Itinerary – The Cotswold itinerary that Andrew put together was very interesting and we enjoyed the change of scenery when walking through colourful fields of rapeseed, wheat and barley, farmland, and then through the wooded countryside. Along the way, sights like Sudeley Castle and Hailes Abbey added interesting historical perspectives, and then of course there were the charming villages as well. Although I initially thought that 20 km was a bit much for me, it turned out not to be, as it was mostly quite easy walking. Baggage Transfers – Each day our bags were transferred from village to village without a hitch. The people doing the transfers have a good system of identifying where your bags are going next. Quality B&Bs – The quality of B&Bs booked by Andrew exceeded our expectations. The rooms were very nice, some had free WiFi and the owners were very hospitable. At the end of a long day’s walk, it was a joy to check into a comfortable room in our B&B. Accuracy of instructions – As Andrew warns at the beginning of his booklet, the Gloucestershire County Council Rights of Way department and the Cotswold Voluntary Wardens are continually carrying out improvements such as replacing stiles and kissing gates and we did see a number of new gates that had replaced old stiles. When you see a new gate where a stile was supposed to be, it is usually because of improvements by the Gloucestershire County Council or the Wardens. Disappearing paths – Sometimes, due to field preparation by farmers, the walking paths are not visible as they have been covered by cut grass or similar. Do not panic, just follow your instructions or the map (you do have a map, right?). If the farmers are on their tractors in the fields, they will point you to the right way. Shoes – They say that you should never go on a long walk with new shoes. I have one other advice to add. Never go on a long walk without checking your old shoes. My expensive Scarpa walking boots, although used on three occasions only, were nevertheless bought several years ago. On Day 2, the whole sole peeled off my right shoe and the left one looked like it could go at any time. Local Buses – If you think you may want to use the local bus to get from town to town, check out the timetable before you leave home. When my shoe sole peeled off we thought we would catch a bus, but the only service for that afternoon did not leave till 5.15 pm. Unpredictable Weather – You can never predict the weather. We went equipped for some summer rains and cool evenings, but it turned out to be extremely hot and dry for the whole time we were in the Cotswolds. Accommodation – The hotels and B&Bs in the Cotswolds are usually housed in converted coaching inns or conventional English homes, and they are generally not air-conditioned or geared up for hot weather. Sometimes people worry about doing walks like the Cotswold Way Walk for fear of getting lost – and I must admit to having some concerns at the start. But if you have proper instructions such as those provided by Andrew, you really needn’t worry. The best way to enjoy the beauty of the Cotswold area is by walking and thanks to Andrew, our Cotswold Way walk was very enjoyable and successful. This has certainly inspired us to do more walks in the future. If you’d like to get in contact with Andrew, his contact details are at www.cotswoldwalks.com.